Two days, BMW North America hosted the BMW Z4 Press Launch in the sunny California and during the webcast many journalists present there or back home, had the opportunity to ask the panel questions pertaining to the Z4 . Even though we shared some of this answers on Twitter during the conference, we would like to give you the entire FAQ session. If there is one article that we recommend this week, then this is the one, there are some great information in here and many things that were not known by many of us before. What model year is this vehicle? It is being introduced as a 2009 model. What will be the vehicle’s on-sale date and what are the MSRPs of the two models? What features make the new Z4 Roadster worth the price increase over its predecessor? The new Z4 Roadster is a completely new vehicle with added substance and value. It now features an aluminum retractable hardtop (20 seconds to deploy or retract) and the vehicle concept has been made larger to feature a new level of comfort, better storage space. It is now a “year-round roadster” and features tremendous practicality. It should be noted that the new model’s base engine served as the top-choice engine for the previous generation Z4. The versatility of the Z4 has improved to the point that it will now be considered more often to be used as a driver’s primary transportation (rather than serving as a weekend car). What is your planned volume over the vehicle’s lifecycle? We intend to continue our leading role in the premium roadster segment (The former Z4 had a 45% share of the premium roadster market in the US). Exact volume forecasts are difficult to predict due to the fluctuating market environment, but looking at 2009, we expect to sell a couple-thousand units. What main competitors are you taking on with the new Z4? The segment competitors are the Mercedes SLK (from $50,900), the Audi TT Roadster (from $45,100), Porsche Boxster (from $46,600) and Boxster S (from $56,700). Additionally, the remarkable practicality of the new Z4 will attract buyers who currently drive other types of vehicles (coupes, small sedans, etc.). Is this car based on the previous Z4 platform or some other platform? BMW does not use platform engineering as you would understand from the domestic industry. Instead, BMW has a variety of modular systems that can be mixed and matched to meet the needs of different concepts. In each case, these systems are optimized for the specific model. The new Z4 Roadster is built on a unique unibody but features electronics, drivetrain components, and suspension design that are all similar to those of the 1 Series and 3 Series models. What are or were the biggest Z4 markets? The USA is the largest single market accounting for approximately 35 percent, Germany (25 percent), the UK (10 percent), and Italy (approx 6 percent). What are the main innovations versus the former Z4? This is the first BMW Roadster with a retractable hardtop. It features greater agility, more standard equipment, and considerably more space in the passenger and luggage compartments. It features completely new exterior and interior designs with materials and colors that offer higher value and quality. New features include standard Xenon Adaptive headlights and Driving Dynamics Control, and options like the M Adaptive Suspension and Dual Clutch Transmission (DCT). BMW’s 4th-generation iDrive management system for infotainment is also available. What is the exact meaning of the term “sDrive”? To maintain consistency with other models and to permit consistent product nomenclature worldwide, sDrive references the sporty, rear-wheel drive configuration, and is used on the Z4 in the same way that the xDrive name is used to denote BMW’s all-wheel drive models. What is the typical customer group you are looking at with the new Z4? Our roadster target group is male but includes both male and female singles and the young-at-heart. These people are usually unconventional, spontaneous, and self-driven, looking for cars with a youthful, classy flair which also offer lots of driving pleasure. Often the Z4 is not the only car in their households. Where do you plan to win over your new customers? Primarily from camps of roadster and convertible drivers, but also in the coupe and small sedan segments. For some, a roadster is a car they spoil themselves with once in a lifetime. The new Z4 is enough of a complete product that it is likely to be used as primary transportation for many customers. What were your design targets when developing the new Z4? For a BMW Roadster we always project the thrill of open-air driving through the proportions, surfaces, and details of the car. As with the former Z4, our main focus was on features typical of a roadster: low waistline, low trunk, low seating position, and a car that crouches low on the road. Added to this were the other proportions such as a long hood, a short but muscular rear end, and short body overhangs. In the interior design of the car, issues such as driver orientation and functionality play a substantial role, with particular significance given to high-quality materials, touch and feel, and practical storage options. What engines will you offer in the Z4? In the US there will be two inline-6 engines, the Z4 sDrive30i (255 hp) and the Z4 sDrive35i (300 hp). Both are 3.0 liters in displacement. The sDrive30i engine features magnesium-aluminum composite construction, BMW’s Valvetronic and VANOS technologies, coupled with a variable-resonance intake manifold. The sDrive35i engine is all-aluminum and features twin low-mass turbochargers and BMW’s High Precision direct injection. Will there be a diesel and/or an M version? With regard to an M version, BMW will obviously consider various options, but right now we do not have any plans of this kind to announce. With regard to a diesel version, BMW constantly explores such options but believes it is launching the new Z4 with engines that are best-suited to a roadster’s emotional driving experience. To what extent does this sports car comply with your EfficientDynamics philosophy? BMW’s EfficientDynamics engineering strategy is highly evident in the new Z4 Roadster. Depending on the engine variant, the new Z4 comes either with completely-variable valvetrain control (Valvetronic with double-VANOS) or High Precision direct injection. Other EfficientDynamics measures include on-demand management of ancillary units, fitment of a low-drag final drive, a variable oil pump, optimized aerodynamics, and intelligent lightweight construction (the aluminum hood, for example). How many different types of transmission will you be offering? Both models are equipped with a standard 6-speed manual gearbox. The Z4 sDrive30i will be available with a 6-speed automatic, and the Z4 sDrive35i offers an optional 7-speed Dual Clutch Transmission (DCT). On a sports car like the Z4, why is BMW giving up the traditional handbrake lever? The electrical handbrake activated by a button on the center console does not create any disadvantages. At the same time the new parking brake control frees up console space and is simple to use. What is improved on the Adaptive M Suspension? This optional suspension enhances the excellent agility of the new Z4 to a higher level thanks to electronically controlled shock absorbers. It also lowers the entire car by 10 millimeters or almost 0.4”, helping to provide a fast reaction in sudden steering maneuvers and ensure greater precision when steering into bends. And thanks to its Electronic Damping Control which quickly adapts to current driving conditions, the Adaptive M Suspension can offer the same driving comfort as the standard suspension, plus a very sporting and dynamic set-up for maximum feel and feedback. How does Driving Dynamics Control work? Featured as standard, this advanced system varies response of the gas pedal and engine, the power steering assistance, and DSC response at the touch of the console-mounted rocker switch. On cars fitted with automatic transmission it also influences the gearshift behavior, and on cars fitted with the Adaptive M Suspension various Electronic Damping Control modes are activated. The driver chooses among Normal, Sport and Sport+ modes, in each case activating a configuration that is well-balanced in its overall behavior. In Sport mode, for example, steering behavior becomes more direct and the response of the engine becomes more spontaneous. In Sport+ mode, Dynamic Traction Control is activated automatically, enabling the driver to take bends in a slight, well-controlled drift. Why doesn’t BMW stick to just one mode, why all these options? The road changes and so does the driver’s mood, spirit and traffic. Engineering faces a permanent target conflict of ride compliance vs. body control for precision. The less dynamic the drive (based on traffic, weather, mood, road conditions…) the more ‘normal’ the setting used. More dynamic (up to race track style) conditions suit the more sporty settings. It allows a car with different personalities that you can tune to your liking. How quickly does the new roof open and close? Deploying or retracting the standard aluminum-shell hardtop requires a maximum of 20 seconds. What are the highlights on the body? In particular the new retractable aluminum hardtop, the wide range of storage options (far better than on the previous model), the crosswise storage shelf behind the seats, and the increased volume of standard equipment. There is also the more sophisticated style of materials over the former model. Is the luggage compartment of the new Z4 large enough for large luggage? Yes, the new Z4 accommodates the wide range of luggage (two small cases or a medium-sized hard-shell case) two persons will typically take along on an average trip, or a standard-size golf bag, even with the roof open. And with the roof closed even up to four crates of beverages and, thanks to through-loading system, two pairs of skis will fit conveniently into the car. Two golf bags may be carried with the hardtop deployed and using the pass-through system. Will there be a Z4 Coupe one day as a derivative? None is currently planned. This car serves brilliantly as a year-round BMW Roadster. How do the dimensions of the new Z4 differ from the former model? Coming with the same wheelbase, the new Z4 is 5.75” longer and 0.35” wider, but remains as low as before (same height). At the same time you have significantly more headroom (+0.20”), more shoulder freedom (+ 0.98”) and greater elbow room (+ 1.73”) inside. Why has the new Z4 gotten so heavy? The new Z4 has grown slightly in weight compared to the previous version, primarily due to the increased amount of standard equipment such as the folding aluminum hardtop. The new Z4 is significantly larger and offers greater performance. Remarkably, if we compare it to the iconic all-alumimum BMW Z8 Roadster, the Z4 sDrive35i with 7-speed DCT has a curb weight of 3494 lbs, identical to the weight of a Z8 without its accessory hardtop installed. The new Z4 offers nearly-matching performance and more interior room than the Z8. 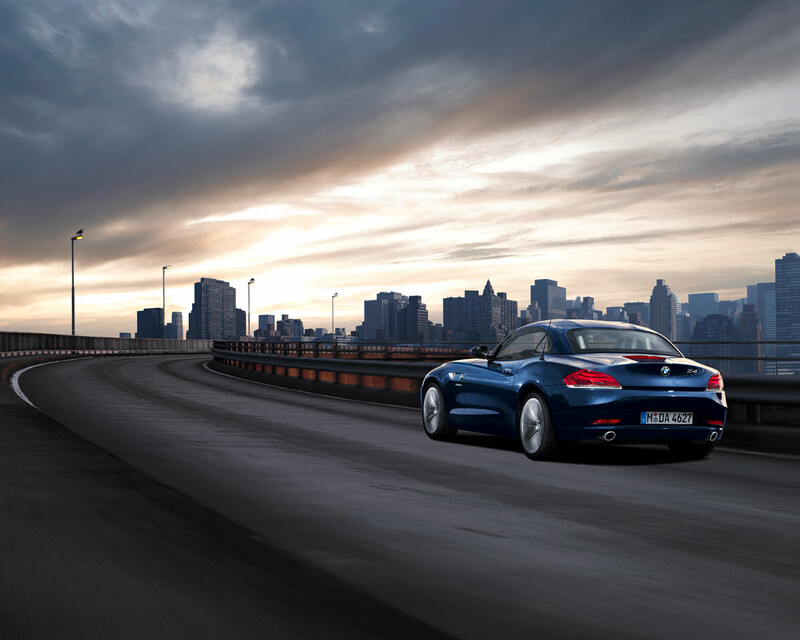 It also offers substantially more advanced infotainment and safety systems than the exotic Z8. Even though it adds some weight, the Z4’s retractable hardtop makes it a true four-season roadster and doesn’t compromise its superb balance. The Z4 will be available with SunReflective leather. What precisely does that mean? SunReflective technology significantly reduces the generation of high temperatures on the leather surface caused by sunshine. BMW has introduced this technology successfully on other BMW Convertible models. Special color pigments are integrated into the leather dyes that reflect the infrared radiation in sunlight. What about rollover safety in the new Z4 with the roof open? Like previous BMW Roadsters, the new Z4 is well-prepared for the unlikely event of a rollover. It offers an extremely stiff body structure, massively reinforced A-pillars, and safety bars behind the headrests. Last but not least, head/thorax airbags integrated into the seats offer additional protection. Why is the new Z4 no longer being built in Spartanburg/USA, but rather in Regensburg? Spartanburg now focuses exclusively on BMW SAV models. We have chosen Plant Regensburg for the Z4 because that is where we maintain our skills on retractable hardtop systems (Regensburg also builds the 3 Series Convertible).